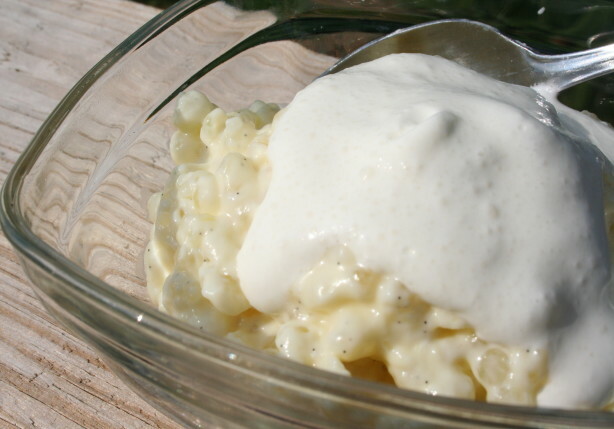 We serve our tapioca pudding cold topped with a little fresh whipped cream. I found the tapioca pearls in the bulk section of my health foods store. Note that the tapioca pearls must soak overnight before you can prepare the pudding. Soak the pearls in water overnight, covered well with water. Drain the water off. Heat the milk, cream, vanilla bean (split and scraped), and tapioca to a slow simmer in a heavy pot and cook for 1 hour, stirring often. Add the sugar and salt. Bring to a simmer being careful not to let the tapioca stick to the bottom of the pan. Put the yolks into a bowl and stir in some of the tapioca mixture to temper the eggs. Then add yolks to the pan while stirring. Pour into a bowl and cool. You can it it warm (as I hear it is often served in the colder months) We like ours after it has chilled several hours in the fridge at any time of year.